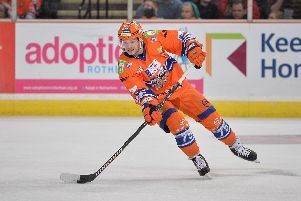 Josh Unice, the American goaltender who bailed Sheffield Steelers out when they were hit by injury to Frank Doyle, believes he can be the Elite League’s best netminder next season. The 25-year-old is awaiting an offer from new coach Paul Thompson; the team boss is adamant he must take his time to secure the best candidate available. Unice said: “We will see the decisions they make. Paul is a world class coach so he will do what he feels is best for the team as I will have to do what’s best for me. “But we will see if it will all work out for the best for both parties, I’ll just have to see what happens. “I have learned from last year obviously and I think I more then proved my ability to play in the league. “I can be the best goalie in the league, I just need the chance and if I’m given it I won’t let the fans, Paul, or the Smiths (club ownership) down” said Unice. “But it all goes back to being given a opportunity. Whoever gives me it - whether it’s the Steelers or someone else - won’t regret it. Unice, who recognises the ambition of the club as it embarks on a new era of expansion, made a superb contribution to the League title win. And while he wasn’t on his best in the Play Off final defeat to Coventry Blaze, he should not be judged on that game alone - rather his overall performance in a Steeler shirt. The goalie had a 91 per cent save ratio in his 23 Steeler games in League and Play Offs, which was on a par with Doyle. Doyle added: “He did what he had to do in some stressful situations to win the League. It is unfortunate for him the season didn’t end with a Play Off win in the final against Coventry. While Steelers have yet to offer Unice a deal, I understand that they have done so with another import netminder...although that has not been accepted at this point.